The Batwa are a forest people recognized as being the first inhabitants of the land. They are traditionally a hunter-gatherer community. The Batwa represent some of the poorest and most vulnerable minority groups in the Great Lakes Region found in Rwanda, Burundi, the Democratic Republic of Congo and Uganda. As hunter-gatherers and former hunter-gatherers, they are commonly associated with the bush by their neighbours and stereotyped accordingly. 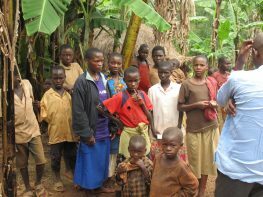 This small Batwa community have been locked in a land dispute with their neighbouring majority community for over 40 years. In 1975, the local Burundi court granted the Batwa rights to access and ownership over the land in dispute, but this decision has never been enforced, and the community remains deprived of access to their land. In 2005, in violation of usual court procedure, the case was re-opened by the judiciary on request of the majority community, and decided against the Batwa, in clear violation of national and international law. In 2011, a case focusing on the right to effective remedy and execution of judgments, together with the right not to be discriminated, was brought before the African Commission on Human and Peoples’ Rights. In 2014, the Burundi Government provided submissions on admissibility well beyond the African Commission’s timeframe for doing so. MRG responded to these submissions. The case remains pending before the African Commission. While awaiting a date for the oral hearing, the community has been attempting to resolve the dispute locally. In August 2016, the Inspector General of Justice conducted an onsite visit to the disputed area and determined that the land belongs to the Bahakwaninda family. MRG will continue to monitor enforcement so that this long running dispute can hopefully come to an end.